These shirts are not only flashy, they are also a beautiful blend of fabric textures. The back and arms are a non clinging polyester microfibre. 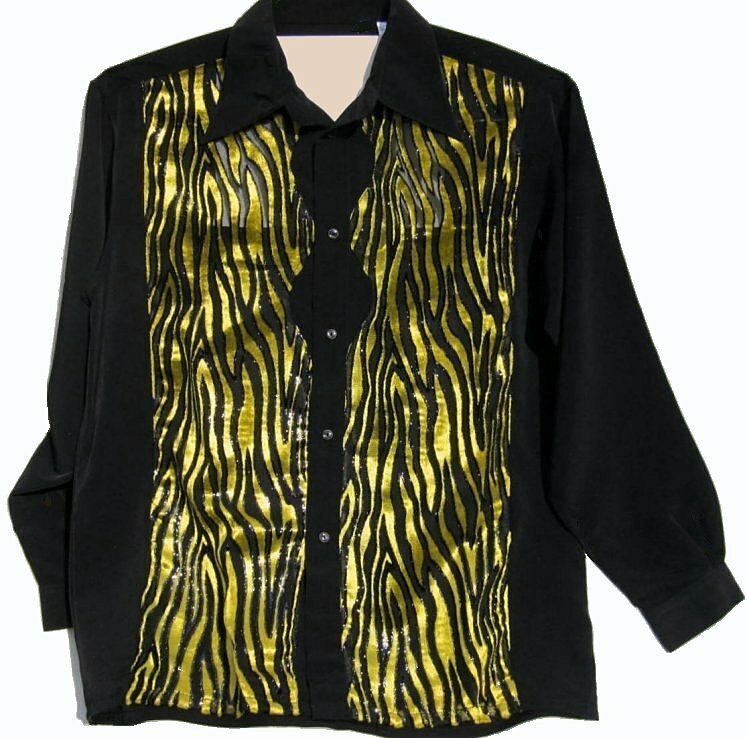 The front is a black polyester fine sheer fabric that is dissected by an attractive loud shade of shiny yellow velvet. The velvet flames are trimmed with a sparkly black velvet. A handsome and flashy result. The fabric is a high grade, appropriate for a Vegas performance or disco party. The shirt has a normal dress shirt cut, not wide cut. The chest area measures a few inches more than stated chest fit. This shirt measures 50" around at armpit level for a roomy 46 chest fit. The shirts can be machine washed on gentle, hand washed or possibly dry cleaned w no heat.